The Simone 1 Carat Asscher Cut Cubic Zirconia Halo Solitaire Micro Pave Solitaire Engagement Ring is a stunning ring with a 1 carat 6mm asscher cut diamond quality cubic zirconia center surrounded by a single halo of micro pave set round cubic zirconia stones. This asscher cut engagement ring features a beautifully detailed gallery that adds to the feminine flair of this solitaire. The micro pave set round hand cut and hand polished Russian formula cubic zirconia continue halfway down both sides of the shank of the solitaire. The shank measures approximately 1.8mm in width and this solitaire is also available with a matching contoured band, please see item S1082CL to purchase the set. 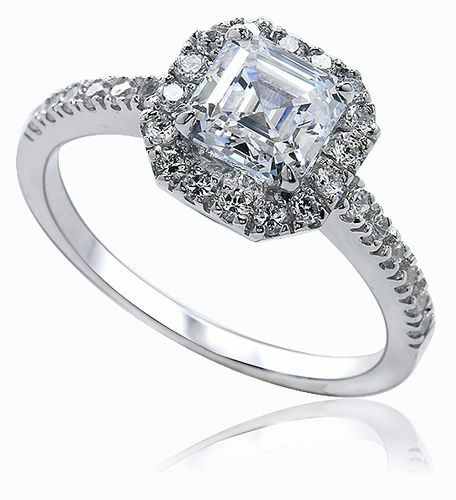 Ziamond also offers you the flexibility of adding a second matching band, just call for a quote. Available in 14k white gold, 14k yellow gold or special ordered in 18k white gold, 18k yellow gold or luxurious platinum. 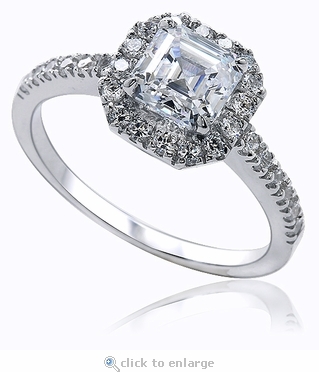 The Simone Solitaire can be purchased as a wedding set with a matching band, see item S1082CL. For further assistance, please contact us directly at 1-866-942-6663 or visit us via live chat and speak with a live representative. This item is a clearance item. Due to extremely low pricing, all clearance items are a final sale.